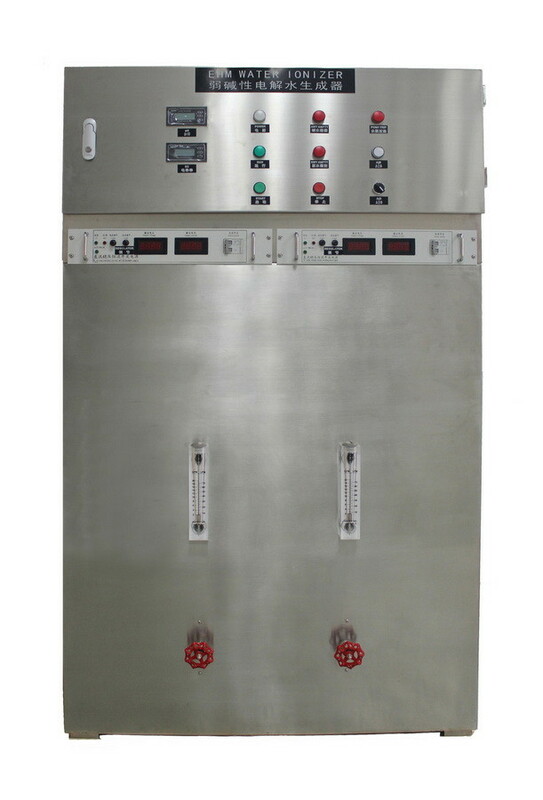 EHM's Newest High technology industrial & commercial water ionizer purifier, with 3000L/hour. Better Performance!!! #304 stainless steel machine housing-----Strong protection and never rust. Looking more professional and elegant. Coming with Easy installation and Operation system. Continuously Working large capactity water ionizer purifier with 3000L/h alkaline or acidic water outputting. The PH value of the output ionized water is between 5.0 and 10. The Plates usage life is more than 25000 hours. The packing size is L170*W75*H205cm. Source Water: The source water meets the standard of your country and the rigidity is less than 100mg/L and the water pressure is between 0.1 and 0.25Mpar. The rigidity of municipal water is less than 100mg/L according with national standards and the water pressure is more than 0.3Mpar. The humidity should be less than 80%. The net weight is around 550KG including the following fittings: 2 switches, 1 fuse, instructions for ORP, pH, conductivity, several plastic parts. Acidic electrolyzed oxidizing water, low PH value (5.0 or less) and high ORP (+1100 mv or above), beyond the scope of various pathogenic micro-organisms to survive and make cell membrane potential change, leading to cell membrane permeability-increasing and the destruction of cell metabolism enzymes, microbes quickly die. Meanwhile, the acidic electrolyzed oxidizing water and contains 50-80mg / L of chlorine to more effectively kill pathogenic microorganisms. Producing precise pH for various using. And can meet the large water output requirement. It could incoporate to the industrial water treatment/purification system. (1) can keep the cattles healthy, keep their furs shining, and improve the milk production. Safety Emissions: acidic electrolyzed oxidizing water in irrigation or placed after a certain time, be able to restore its own ordinary water, and plants were polluting the environment and residual. EHM Group Ltd has been specializing in water treatment & healthcare products for many years. With years of endeavor, EHM has developed to be a manufacturing, selling, and after-sale service integrated Hi-tech enterprise. EHM Group Ltd own comfortable working environment, sophisticated production and testing equipments, excellent quality management and a solidary & high efficient management team. We are in chase of strict management, super-level quality. Our company and factory has passed the BV, TUV, and ISO9001:2008 certificates. Most of our products, including the house-hold alkaline water ionizers, industrial/commercial water ionizer, alkaline water pitchers, alkaline water flasks, have passed CE certificates and SGS tests. At the same time, we possess design patents of some of them. Our products and EHM brand have won great reputation both domestic and abroad, we established partnership with a lot of brand-renowned companies, internationally, and our products are sold to Europe, North & South America, Africa and Southeast Asia over 50 countries and regions. And now EHM Group Ltd has become to one of the largest water ionizer exporter from China.